The death of three “Maoists” in an encounter with the police in Lohardaga district of Jharkhand on Sunday may snowball into a problem for the ruling UPA Government. CPI(ML) workers, led by Neeraj Kunwar, are now planning to hold dharnas across the state against the police claim. They also claim that those killed by the police were not Maoists. Kunwar, who led a dharna outside the police station in Lohardaga on Tuesday, said out of the three -Nukul Yadav, Helen Gudia and Joseph Topno – who were killed, two were members of their party. “Gudia and Topno were not Maoists. They were innocent. The police killed them in a fake encounter,” he alleged. “We will write to the NHRC if the state Government does not register a case of murder against the policemen,” said CPI(ML) leader Anant Prasad. Both Kunwar and Prasad demanded a compensation of Rs 5 lakh each and a job for the kin of the deceased. None of the state Government authorities, including DGP V D Ram and CM Madhu Koda, were ready to comment on the allegations. “Their allegations are bogus,” claimed Lohardaga SP. With Jayanti Soren (23) succumbing to bullet injuries at Sadar Hospital in Giridh on Monday, the toll in the Chilkhari massacre has risen to 19. In a related case, Deori police station Inspector Vidhu Bhushan Dewedi, his wife Rajshree and son Avinash launched a fast-unto-death at the site of the massacre, demanding revocation of his suspension. 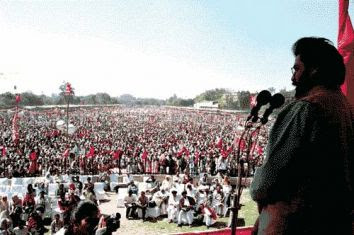 Dipankar Bhattacharya addresses the ‘Inquilab rally’. Organised by the Communist Party of India (Marxist-Leninist) Liberation, the rally fell on the 76th anniversary of the martyring of independence heroes Bhagat Singh, Sukhdev Thapar and Shivaram Rajguru. With the executioner’s rope over his neck, Singh shouted “Inquilab Zindabad” (“Long live the revolution”). The CPI(ML) rally was called “Inquilab rally” in memory of these heroes. Bhagat Singh’s nephew Jagmohan was a speaker at the rally. The Communist Party of India (Marxist) dominates the LF government, which has held power for 30 years in West Bengal. The CPI(ML) was the result of a 1968 split from the CPI(M), after the newly elected LF government crushed a 1967 uprising of the rural poor in Naxalbari, in the state’s north. More details of the March 14 massacre have come to light. According to a fact-finding report conducted by the Association for Protection of Democratic Rights and Paschim Banga Khet Majdoor Samity (an agricultural labourer organisation), authorised by the Kolkata High Court, at Bhangabera on the outskirt of Nandigram a group of mostly women and children were praying on March 14 when, without warning, police started indiscriminately firing on them. Those who tried to escape were hunted down by CPI(M) thugs disguised as police. The report revealed that the cops and hooligans then went on to ransack and indiscriminately fire upon the villagers’ huts, killing and injuring more. No less than 100 people were injured. Some victims were too scared to go to the hospital. “A good number of women have complained that they have been raped, sexually abused and molested by police personnel and the murderers of the political party [the CPI(M)]”, says the report. The report accused local CPI(M) MP Lakhman Seth of having engaged “professional murderers” to finish up the atrocities initiated by the police. What do you think about the Nandigram violence? Nandigram didn’t happen overnight. Mini-Nandigrams have been happening in West Bengal since years. In May 1993, at Karanad village in Barddhaman district, on the day of panchayat elections, five agricultural labourers were lynched and burnt alive by CPM goons. Reason? They questioned the CPM’s anti-poor policies and joined the CPI-ML. Singur has inaugurated a new phase in politics. Sharecroppers and small peasants were the mainstay of the CPM in Bengal. Now, they are challenging the government’s policies. After 30 years in power, CPM just cannot accept the fact that the rural poor in the state have the guts to challenge it. This intolerance is at the heart of the whole episode. At Nandigram, in January, the farmers had their apprehensions because they had seen how land was snatched from the people at Singur without their consent. At the first warning that their land could also be taken away, they rose in protest. On January 6, the administration convened a peace meeting. It was decided that the police won’t be sent into the village and the people would repair the damage caused to roads and bridges. But that decision was just a smokescreen. While the peace talks were on, the CPM organised its armed goons and they ran amok at Nandigarm, killing seven people. Even after that, they (CPM) did say that if the people don’t want SEZ, we were not in hurry to acquire their land. At the same time, several CPM leaders including Health Minister Suryakant Mishra and the Kisan Sabha leader Binoy Kumar were issuing not so veiled threats to the people. Just before the March 11 incident, CPM organised a big rally in Kolkata to show that the peasantry of Bengal was in favour of the SEZs. In that meeting, Chief Minister Budhhadeb Bhattacharya had said no single area or a couple of panchayats could stop “our onward march”. Binoy Kumar openly declared that they “will make life hell for the people of Nandigram”. Then came the genocide. Nandigram is a clear case of a cold-blooded police operation. Initially, Budhhadeb said, “I was under tremendous pressure to send police in”. Then on the floor of the Assembly, he said the police had opened fire in self-defence. Finally, he said, “I take moral responsibility. We didn’t anticipate this. I am sorry for the police excesses”. It was pre-planned. Even CPM leaders at the national level had approved the blueprint of the operation. The whole idea was to teach the peasants a lesson. Against the backdrop of Nandigram firing, what does Left politics in India mean? There is a very clear divide within the Left. The opportunist group, which has been numerically and electorally dominant, now stands unmasked. The unmasking began 40 years back when the Naxalbari incident happened. On the one hand, you have examples of degeneration of the Left in power. On the other, you have growing peasants’ resistance. When you speak to the victims of Nandigram, they only talk about the injustice meted out to them, and ask if there is any political solution for that. There will be fresh growth of the Left movement in this country. Polarisation has happened between the derailed Left and the revolutionary Left. The derailed Left is busy killing peasants and the rural poor to appease Big Capital. When the Left came to power in Bengal 30 years ago, they promised that they would provide immediate relief to the people and restore democracy, which was murdered by the Congress regime during the Emergency. Over the years, they have even curbed the freedom to protest and suppressed peasants’ movements. The CPM neither listens to the Left intellectuals nor to the peasants. But the real Left, like our party, is still fighting for the rural poor. In the days to come, you will witness the Left polarisation clearly. Do you mean that the years in power have eroded the Left’s mass base in Bengal and corrupted it? You can’t say that power will invariably result in this. They could have used the power for different purposes. But they feel so “responsible” to the system and the ruling classes that they have completely redrawn their priorities. It is this reversal of priorities that has resulted in Nandigram. After 30 years in power, now the Left Front government of West Bengal will be known for the police excesses at Nandigram and Singur, not for land reforms or panchayati raj experiments. Where do you see CPI, Forward Bloc and RSP standing? Singur and Nandigram, they have raised voices of protest. The two meetings they held in Kolkota gave the impression that they were out to debate the issues threadbare. But at the Front meeting, the CPM said, “Henceforth, we would listen to you more” and there would be more meetings. Their protests ended there. It’s time for people to speak out. Sumit Sarkar and Tanika Sarkar did. Prakash Karat expressed regret, only after four days of silence. If Budhhadeb really feels morally responsible, he should quit. Do you see these incidents as the beginning of the end of Left rule in Bengal? Definitely. The CPM has never been so isolated as it is today. Nobody believes them today and I find this isolation a major blow to the party. Certainly, the Budhhadeb government has lost its popular support and public trust. Do you expect any realignment of the Left bloc? There has always been much talk of the struggle between Kerala line vs Bengal line in the Communist Party of India (Marxist). This time we have, not a struggle between Kerala vs Bengal but a controversy between the active pro-liberalisation ‘young turks’ and the conventional, passive pro-liberalisation old guards in the CPI(M). After a period of lull following the factional reconciliation over the choice of VS Achuthanandan as Kerala’s new CPM Chief Minister, the rift between the Achuthanandan and Vijayan factions has again started growing. Pinarayi Vijayan, Politburo member and state secretary of the CPI(M) has earned the dubious distinction of perhaps being the first ever Politburo member of a Communist Party facing a CBI enquiry for corruption charges in the history of the Communist movement in the country. A recent Kerala High Court judgement has ordered a CBI enquiry into the SNC Lavalin scandal; in which Pinarayi Vijayan stands accused of having taken kickbacks to favour Lavalin over others offering a better deal, during his tenure as Power Minister in the previous LDF regime in the state. VS, who had campaigned hard against Coca Cola and ADB loan during the Assembly election last summer, now finds himself in the unenviable position of defending a huge $222.2 million (Rs. 995 crore) loan agreement his government has signed for the Kerala Sustainable Urban Development Project (KSUDB) with the same ADB. VS and his supporters claim that the agreement has been signed behind VS’ back on behalf of his government with the connivance of the Vijayan faction. This has resulted in an open rupture in the CPI(M) with VS supporters clashing with Vijayan supporters in VS’ native district, and even organizing a signature campaign against Vijayan – an act that amounts to indiscipline in the party. Finally, the Central Committee had to intervene to restore a semblance of unity by forming a 5-member advisory committee comprising the LDF convener as well, which is supposed to meet every week to iron out differences in running the Government. Prakash Karat has also admitted that contrary to the claims of the Vijayan faction and Finance Minister Thomas Isaac, VS was indeed kept in the dark! In West Bengal, the Haldia Development Authority issues a land acquisition notice that takes a toll of more than half a dozen lives. The Chief Minister and all senior Party leaders first deny that such a notice was at all issued and then Buddhadeb says it was a blunder and that he has asked the district administration to ‘tear up that piece of paper’! In Kerala a loan agreement is signed with the ADB and the Chief Minister claims he did not know about it! Who is the CPI(M) trying to befool? And if indeed these claims of ‘ignorance’ are true what has happened to the tenets of collective functioning within the CPI(M)? Or will the CPI(M) now agree that MNCs, big corporate houses and international financial institutions have developed their own lobbies within CPI(M)-led governments? No matter whether VS was in the dark or not, the ADB loan has major adverse implications for the nature of governance and social sector spending in Kerala. Prakash Karat says that the party is not against taking loan from any bank in principle, including ADB, as long as Structural Adjustment strings are not attached. The fact is that no loan or aid from such international institutions comes without direct or indirect conditionalities, but the CPI(M) naturally needs to keep alive a fiction to the contrary. ADB loans in particular are known to carry conditionalities like increased private participation, privatisation and commercialisation of public utilities, creation of a flexible labour force, etc. Finance Minister Thomas Isaac is however thrilled that the ADB conditionalities in case of the KSUDB loan are less harsh than in the case of the Kolkata Environmental Projects! The Bank, according to Isaac, has ‘conceded’ that user charges for water will be levied from municipalities instead of individual consumers in the beginning. This is certainly not a guarantee that user charges will not be directly levied on individual users ever. Even otherwise, it does not carry any meaning because the municipalities will levy the very same user charges on the very same people in any case. How else can the municipality or the state government raise funds to repay the loan? The first blow of the loan conditions will be in the form of liberalizing the control of Kerala Water Authority (KWA). The process of redefining the role of KWA into an enabling regulatory framework and agency to facilitate private sector participation has already begun. The role of KWA will in future be only to ‘regulate’ the private players in their search for profit and loot of public resources like water. The loan is also an attack on the autonomy of the state and the municipal corporations (the loan initially targets the five corporations of Kochi, Kollam, Kozhikode, Thiruvananthapuram and Thrissur) that will not be allowed to prioritise their annual budgets and revenue mobilization according to their own political and economic considerations. Rather, these will be dictated by the ADB in the interests of private players and multinational corporations. Moreover, ‘consultants’ will have to be appointed – chosen not by the State but by the Bank – at a cost of $10.2 million (Rs 46 crore). The state also loses its right to have bilateral negotiations with other financial agencies. Most importantly, the tariff and taxes will have to be increased and fixed according to the directive of the ADB. Even the people below poverty line (BPL) will not be spared. All existing street taps will now be metered with no budget for new installations. By all indications, the fabled Kerala model of development is now giving way to ADB-driven governance. This would mean, among other things, a serious drop in social spending and greater commercialisation of critical sectors like education, health and hygiene. Ironically, the undoing of the ‘Kerala model’ gathers momentum at a time when renowned economist Prabhat Patnaik, who has been the biggest proponent of the Kerala model calling it the greatest marvel of Marxist theory and practice in India, happens to be the chairperson of the state planning board.